More is better! That was the feeling of Harman and Margaret Blennerhassett as they came to the United States from England in 1797. Their marriage was frowned upon by friends and family in England since Harman was Margaret’s uncle; therefore, their best chance at a happy life together would have to be in a far away country. Having sold his castle in England, the Blennerhassetts arrived in the United States with lots and lots of money…$140,000! While this fortune seemed limitless at that time, the Blennerhassetts spent their fortune recklessly and unwisely, always wanting more. 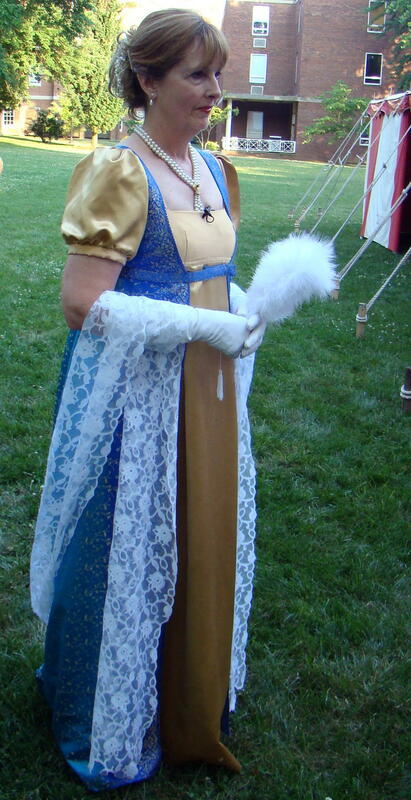 The aristocratic Margaret Blennerhassett was the first historic character for “When Ohio Was the Western Frontier”, the theme for 2012 Ohio Chautauqua in Marietta, Ohio on the campus of Marietta College. She received a warm welcome as temperatures soared to near 100 in the red and white striped tent. Margaret’s story continued with their search for a place to built their new home, and ultimate discovery of a beautiful tree covered island in the middle of the Ohio River. Margaret thought this would be the perfect place for the elegant home she had in mind so they bought half of the island, approximately 180 acres, for $4500. One corner of the island was cleared of the huge trees so the mansion would appear as a pearl against green velvet as the boats passed by on the Ohio River. Here they built a luxurious twelve room mansion that had thirty-six glass windows, something not common at that time of log cabins with tar paper windows. Two covered porticos flanked the main house leading to its two appendages: Harman’s office and the summer kitchen. Not only was the house a beautiful spot but there were acres of gardens and a greenhouse where citrus fruits grew all winter long. There was even special shrubbery trimmed in the shape of the original thirteen colonies. Margaret especially enjoyed riding her white horse, Robin, over the island appearing as an exotic bird in her scarlet riding cape and feathered hat. Yes, more was definitely better. But their happy life was short-lived here on the spot they called Blennerhassett Island. Some compared it to the beautiful Garden of Eden, but both seemed to have a snake that spoiled their pleasure. This time it was a snake in the form of Aaron Burr that wanted something forbidden. Margaret said that Aaron Burr was a genius who applied to college at the age of eleven and graduated from Princeton at an early age. Burr was a very handsome man who loved fine things especially when procured through other people’s money. After a tie in a presidential election between Thomas Jefferson and Aaron Burr, the recount made Jefferson the President, and the loser, Aaron Burr, the vice-president. Things did not start out on a good foot here, and Burr was more than a little dissatisfied. In 1805, Burr visited Blennerhassett Island for dinner as he was curious about the eccentric foreigner … or perhaps he had heard of the money Blennerhassett had available to “invest” in his plans. Burr led them to believe that this was an easy way for them to increase their fortune. 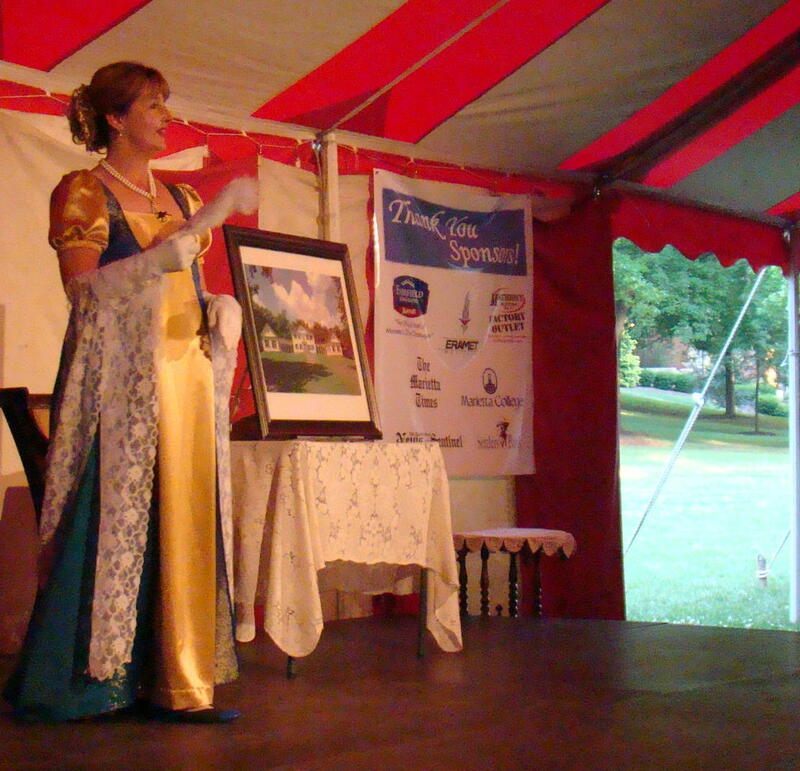 These events took place at a time when the Blennerhassett funds were running low. Margaret felt that Thomas Jefferson was the real serpent that crawled into their Garden of Eden in order to destroy them. There was a lot of animosity between Jefferson and Burr. Margaret said that Jefferson was not the wonderful president that many thought he was. She felt the Louisiana Purchase was illegal, and while considered an inventor said he only had invented two things: a wheel cypher secret decoder and a plow. Thomas Jefferson was said to even cut parts out of the Bible that he didn’t like or wish to follow in his life. It was quite obvious that Margaret did not have fond feelings for President Jefferson. Jefferson tried to destroy Aaron Burr and by association, Harman Blennerhassett. He attempted to use his power to have Burr found guilty of treason. However, Chief Justice John Marshall stood up to Jefferson, and the jury found Aaron Burr not guilty. Burr and Blennerhassett were both released from prison. By this time, their house on the island had been looted with most of the fine things being carried off. The remainder of the items were sold at auction to pay off debts accumulated by the Blennerhassetts. In 1811, their beautiful mansion was burned to the ground. At this point, the Blennerhassett family fell into hardships and eventual poverty for the remainder of their lives. Their hopes and dreams were shattered. Debra Conner’s portrayal of Margaret Blennerhassett was outstanding. Debra actually spent much of her youth in the Marietta community and graduated from Marietta High School. Often during the year, she presents similar programs to the area schools on both sides of the Ohio River as part of their Ohio or West Virginia history curriculum. 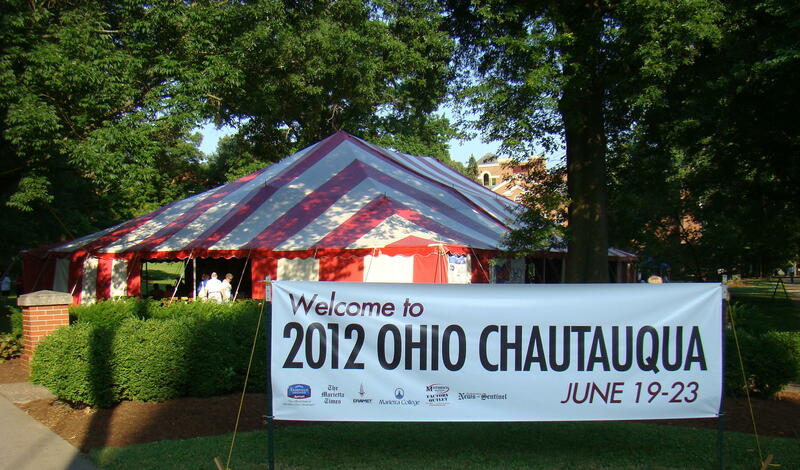 2012 Ohio Chautauqua continues throughout the summer with week long performances and workshops in Urbana (June 26-30), Gallipolis (July 17-21) and Warren (July 24-28). Hope you find time to join them and learn a little more about “When Ohio Was the Western Frontier”.